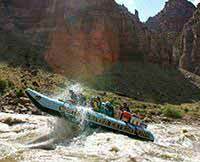 Your Colorado River trip put a fantastic exclamation point on our summer. Everything we needed to know was either on the website, or in the stuff you sent. Good job. I'd offer one suggestion: Put more video on the website. Not just rapids...meals, flotilla, making camp, games, guest testimonials, guide intros, etc. If anything, I thought your website undersold the value of the trip. What's better than an excellent rating? Fantastic? Your people were an absolute pleasure to be with. They were great with our kids, they were great with us. They made the trip safe, informative, delicious, easy, exciting, and most of all, fun. W'ed be delighted to do a future trip with any of them. Mike, Stephen, Shad, Ryan, Amy...thank you! 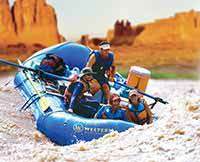 This whitewater rafting trip on the Colorado River was awe-inspiring. Rejuvenating. Life-affirming. Our younger daughter went from "I hate camping" to "This is the best family vacation ever." We're telling everyone we know that if they're even vaguely interested they should take a trip with Western Rivers. We're already plotting our next adventure. You clearly know your business, and you put a fantastic exclamation point on the end of our summer. Thank you.